Just before 4PM on Monday afternoon, a US Navy F/A-18E Super Hornet from Naval Air Station Lemoore crashed just a few miles south of the base. Fortunately, the pilot was able to eject safely and is in good condition, according to the base commander Captain Monty Ashliman. Monday’s weather at Lemoore was reportedly mostly cloudy with a near record-high temperature of well over 100 degrees. Although there is very little information on any possible contributing factors at this point, we’re happy to have our naval aviator back on deck safely. This is now the second Super Hornet crash for FY15. The first incident occurred back in May, when an Oceana-based F/A-18F departed controlled flight following the cat shot off the USS Theodore Roosevelt. Both aircrew ejected and were plucked out of the warm waters of the Persian Gulf. 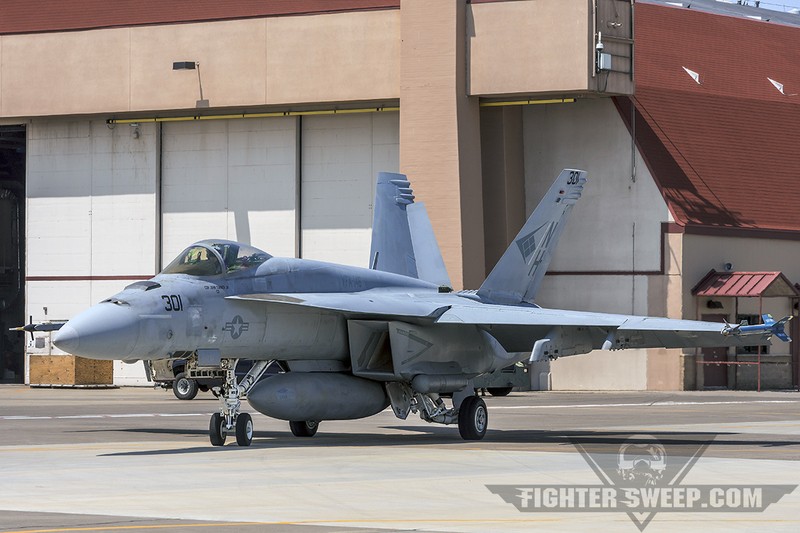 A Boeing F/A-18E Super Hornet from the “Blue Diamonds” of VFA-146 taxis out for a Sentry Eagle DCA mission. We’ll pass more information along as we learn more about the cause of the Rhino crash at the Navy’s west coast Master Jet Base.